Explore the Shaw’s Weekly Flyer Prices. Get this week Shaw’s Circular Savings, grocery coupons, weekly ad sale specials and latest deals & offers. The grocery retailer supermarkets also have in-store a full service Pharmacy staffed with caring professionals. Shaw’s Departments and Services: Bakery & Deli, Produce, Seafood & Butcher Block, Grocery, Organic and Natural, Gift Cards, USDA Choice Beef. Use Husky Card & Campus Cash – valid at select locations. O Organics is designed for anyone interested in maintaining and living an organic lifestyle – USDA Organic Certified. Open Nature uses only natural ingredients – real food made without preservatives, free of artificial colors and artificial flavors. 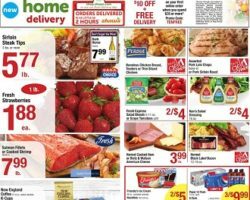 Save with Shaw’s Weekly Circular. Massachusetts – Ashland, Auburn, Beverly, Braintree, Brockton, Burlington, Canton, Carver, Clinton, Cohasset, Dartmouth, East Boston, East Falmouth, Easton, Fall River, Franklin, Gloucester, Groton, Hanover, Hanson, Hyannis, Hyde Park, Ipswich, Leominster, Lynn, Mansfield, Medfield, Melrose, Milford, Newburyport, North Attleboro, Norwood, Peabody, Plymouth, Randolph, Raynham, Salem, Sharon, Shrewsbury, South Yarmouth, Stow, Sturbridge, Sudbury, Wakefield, Waltham, Wareham, Weymouth, Whitinsville, Worcester, Harwich, Hyannis, Orleans. Maine – Auburn, Augusta, Bangor, Brunswick, Dover-Foxcroft, Ellsworth, Falmouth, Freeport, Lewiston, North Windham, Portland, Rockland, Scarborough, South Portland, Waterville, Westbrook, Wiscasset. New Hampshire – Belmont, Center Conway, Concord, Derry, Dover, Gilford, Hillsborough, Hooksett, Lancaster, Littleton, Londonderry, Merrimack, Milford, Nashua, Newport, North Hampton, Peterborough, Plaistow, Portsmouth, Salem, Stratham, Walpole, West Lebanon, Windham, Woodsville. Rhode Island – Barrington, Cranston, East Providence, Middletown, North Providence, Wakefield, Warwick. Vermont– Berlin Corners, Bristol, Colchester, Derby, Fair Haven, Ludlow, Manchester, Middlebury, Montpelier, Poultney, Randolph, South Burlington, Springfield, Stowe, Vergennes, Waitsfield, Waterbury, Williston, Wilmington.